Vern Sneider’s powerful 1953 novel about martial law Taiwan, A Pail of Oysters, has recently been republished by Camphor Press after being out of print for sixty years. The novel received many strong reviews and was even selected by the Notable Books Committee of the American Library Association as one of the 50 books of 1953 which the Committee considered "meritorious in terms of literary excellence, factual correctness and sincerity and honesty of presentation". However, it was also criticized by some pro-Chiang Kai-shek Americans and even condemned as a “thoroughly dishonest book” during a 1954 U.S. Senate Subcommittee hearing on “Strategy and Tactics of World Communism”. Too hot to handle during the McCarthy era, A Pail of Oysters never rose to the level of popularity of Sneider’s first novel, The Teahouse of the August Moon (1951), which not only became a bestseller, but was adapted into an award-winning play and into a motion picture. What was so controversial about A Pail of Oysters that it was so heavily criticized in the United States and banned in Taiwan (a Taipei American School alum recalls the book being passed around secretly, wrapped in a dust jacket for The Catcher in the Rye)? Through its tale of an American journalist, Ralph Barton, who becomes involved in the tragic lives of three young Taiwanese people, the book condemns what Barton calls “the utter stupidity, the ignorance of a small group who not only enslaved eight million people, but who endangered all of Asia”. That “small group” is the faction of the Kuomintang (the Chinese Nationalist Party, or KMT) led by Chiang Kai-shek and his son, Chiang Ching-kuo. During his time in Taiwan, Barton comes to see on a personal level the high costs of U.S. support for the Chiangs’ regime. Much of the action in the novel takes place in Taipei, the capital city of the displaced government of the Republic of China. Li Liu has come to the city from central Taiwan to look for his family’s god that was stolen from his home by marauding KMT soldiers. He encounters Precious Jade and her brother, who have escaped from their adoptive father’s house after Precious Jade ran away from the brothel to which he sold her. At first, they live by selling Billy’s belongings, including schoolbooks he needed to prepare for the university entrance exam. Still needing money to support themselves, the siblings end up working for Barton, and Billy (the only one among the three who speaks English) and the American develop a close relationship. Their friendship ends tragically, however, as a result of a combination of personal revenge and the manipulation of a draconian legal system put into place by the martial law regime. Barton, sickened by the whole experience, first considers leaving Taiwan and putting it all behind him, but is then moved to determine to stay and write to inform Americans about the regime that is supported by their tax dollars, and Cold War rhetoric. Despite its strong criticism of the Kuomintang and its American supporters, Sneider’s novel is not a one-sided diatribe, but a nuanced character-driven story. Readers are moved to care about the lives of the characters - even ones with which they only briefly come into contact. Even the KMT soldiery don’t come off as completely bad. In one scene, Barton interviews a soldier who had retreated with the KMT government to Taiwan in 1949. Although the interview is mediated by Barton’s government-provided interpreter, the tragic tale of the soldier’s loss of his home and family still comes through to Barton and the reader. The novel provides enough information for readers to understand political and socioeconomic conditions in 1952 Taiwan without feeling as though they are reading a social science treatise or a manifesto. Readers of the novel will come away from it not only more informed about a period of early Cold War history that is often glossed over in textbooks but also moved by the touching story of people whose lives are forever changed by those historical events. Interest in Taiwan’s martial law period (also known as its “White Terror” period) has grown steadily since the lifting of martial law in 1987. 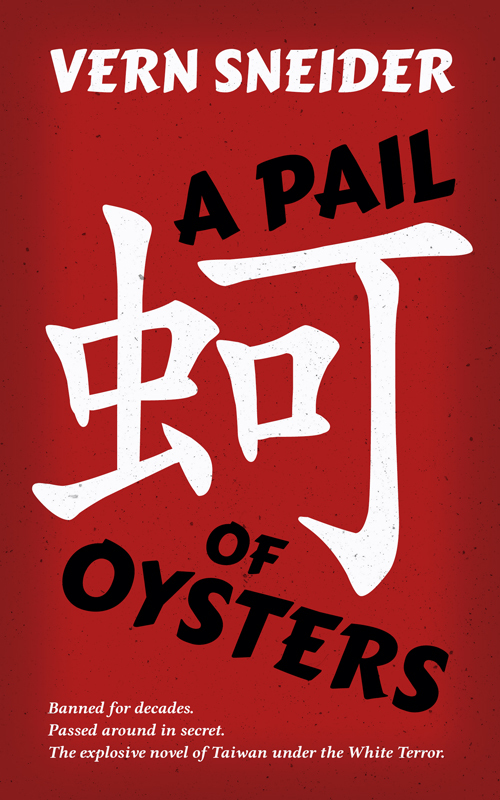 A Pail of Oysters developed a reputation among pro-democracy Taiwanese exiles in the U.S., who saw it as a tale that accurately depicted their sorrows. It was eventually published in translation in 2003 as part of a series of works of Taiwanese literature, but it wasn’t until 2016 that the English original was republished. Before that, a limited number of editions were available at online bookstores, but only at very high prices. Recent interest in Taiwan’s postwar experience has been stimulated by the publication of Shawna Yang Ryan’s excellent novel, Green Island (Knopf, 2016). A Pail of Oysters, written toward the beginning of this era, provides interested readers another emotionally powerful perspective on this period. Jonathan Benda is an associate teaching professor in the Writing Program at Northeastern University, Boston, USA. Previously, he lived for 16 years in Taiwan, where he taught at Tunghai University in Taichung. His publications include the introduction to the new Camphor Press edition of Vern Sneider’s A Pail of Oysters.